2. In psychiatry, self-love; narcissism. Loving one's self; self-love; narcissism (a psychoanalytic term meaning self-love). 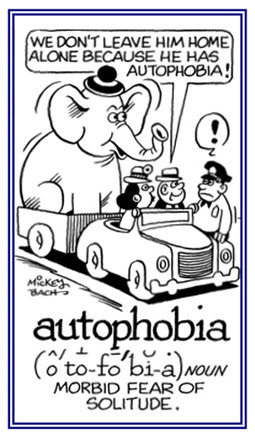 The apprehensiveness of solitude or isolation: Sufferers of autophobia often experience extreme anxiety even when they know that being alone does not threaten their well-being. Some people have autophobias about the possibility of intruders breaking in, or being terrified of strange noises, or even the possibility of developing a medical problem and not having anyone available to take care of them. © ALL rights are reserved. A shrinking away from making any reference to oneself. A kind of barrel organ in which a perforated sheet of millboard determines the notes that are sounded. A spontaneously given, unsought, oracle. 1. An obsessive desire to commit suicide. 2. A condition in which someone is suicidal. Measurement or assessment by the individual of his/her own auditory sensory experiences; such as, the sound created by a vibrating tuning fork. 1. Increased resonance of one's own voice, breath sounds, arterial murmurs, etc., noted especially in disease of the middle ear or of the nasal fossa. 2. A condition in which the patient is aware of the sound of his voice or of his pulse amplified, as it seems, within his/her head. 3. Observation by a practitioner of the peculiarities of resonance of his own voice, when he places his head close to the chest of a patient, and speaks loudly. 4. A condition in which one's own voice seems abnormal, caused by aural catarrh (inflammation of mucous membranes; especially, of the head and throat). A plant capable of synthesizing its own food from simple organic substances. Relating to organisms (as green plants) that can make complex organic nutritive compounds from simple inorganic sources by photosynthesis. 1. Surgical repair or reconstruction of a body part using tissue taken from another part of the body. 2. The repair of defects with tissue from another part of the patient's body. Relating to an individual or cell with two or more copies of a single haploid set; depending on the number of multiples of the haploid set, autoploid's are referred to as autodiploids, autotriploids, autotetraploids, autopentaploids, autohexaploids, etc. Showing page 17 out of 24 pages of 354 main-word entries or main-word-entry groups.